Hello everyone and thanks for stopping by to help celebrate the launch of Hero Arts November My Monthly Hero Kit (more about the kit, blog hop and giveaway below). 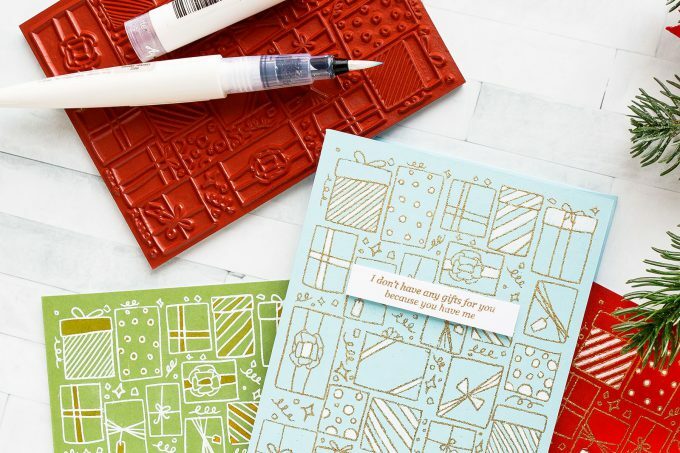 I have one card idea to share using this month kit and several cards featuring add-on items. 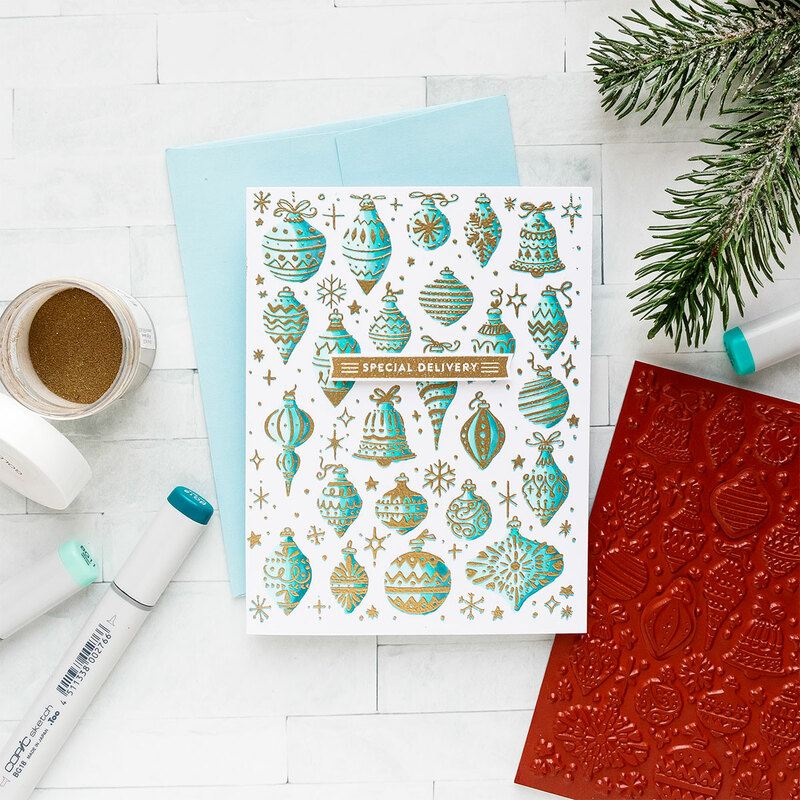 I used the Ornaments background cling stamp from my kit for the main project. This stamp is designed to help you create cute little advent calendars; there’s also a clear stamp set that goes with it and a coordinating die to die-cut little windows for each of the ornaments to make the advent, but I’m not showing that in this video, instead I wanted to focus on how you can use this background stamp on its own without making it into an advent calendar. I inked it up using the light blue ink, Summer Sky Hybrid ink from Hero Arts and stamped it onto white cardstock panel. I picked the color of ink with the color of Copic markers I had in mind. You can stamp this using any color of Copic marker friendly ink, you just need to have an impression on your paper to give you an idea where to color; we’ll heat emboss over the stamping once coloring is done. I used GB11, BG13 and BG18 markers for my coloring and the idea is to color the ornament shapes to make them appear dimensional. The stamp doesn’t actually provide ornament outlines, the coordinating die does that, because I am using just the stamp alone I wanted to add definition to my ornaments and I’m doing that using coloring. The coloring here is very simple, just 3 shades and I have my light coming in from the left so all ornaments are darkest on the right and lightest on the left. There are no stamped ornament outlines to follow so I am basically creating those using my markers. Once my coloring was done I took my panel back into my MISTI tool, stamped the same image over my coloring but using Versamark ink and gold heat embossed it. The result? Beautiful! I adhered my panel onto an A2 white side folding card base and added simple sentiment from my stash. The other projects I’m sharing here are all made using an add on background stamp and also some older Hero Arts sentiments. 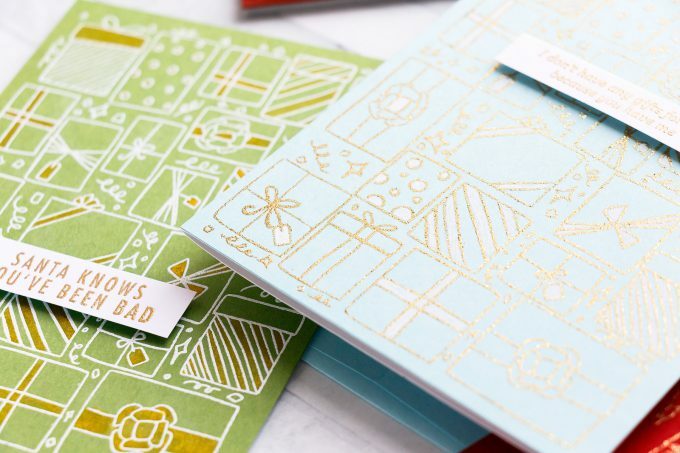 I adore this gifts cling background (it will be well used for years to come; and it can be used for Birthday cards, too), it looks like the gifts are doodled and that style goes perfectly well with my latest obsession – coloring using a white pen. 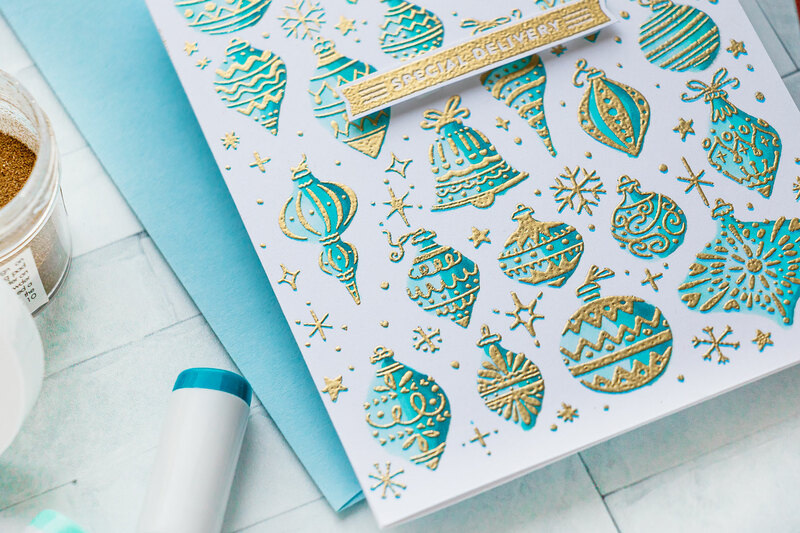 I clear, gold, white and gold glitter heat embossed this background on various colors of cardstock (I didn’t use the clear heat embossed card) and used a single pen or brush to color select sections on the background. I recently shared a more detail video about coloring using a single pen or a pencil – watch it HERE if you’d like to learn more. I used my white pen mostly, but also created a gold shimmer brush to color the green one. I used Hero Arts Glimmer Metallic inks + and old empty Tonic Studios Brush and filled it with the gold ink (and some water). This gave me a handy pen to color with! I went with snarky sentiments for these cards, but any messages would work here. I gold heat embossed sentiment on white cardstock strips and foam mounted over my backgrounds to pop them up. Super easy and simple! I’m Yana Smakula and I’m the last stop on this hop, please feel free to go back a stop to Nichol Spohr or start over at the The Hero Arts Blog. Hero Arts is giving away one kit as a prize to one blog reader – selected from the comments across all of the blogs in the hop so be sure to leave a comment for your chance to win! The giveaway closes Sunday, November 11th at 11:59pm, and the winner will be announced the following week on the Hero Arts blog. 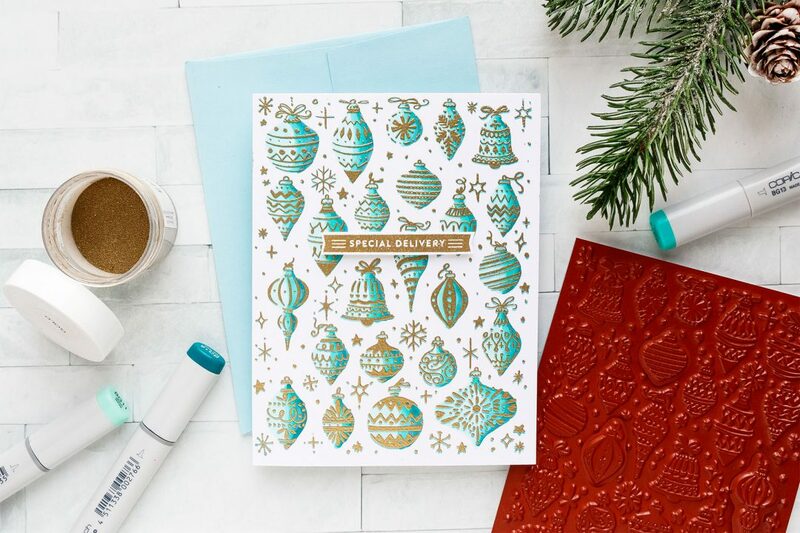 Love your beautiful holiday cards! LOOOOVE your cards Yana! These are fantastic! Yana, your eye for color is always so impressive! Beautiful work! 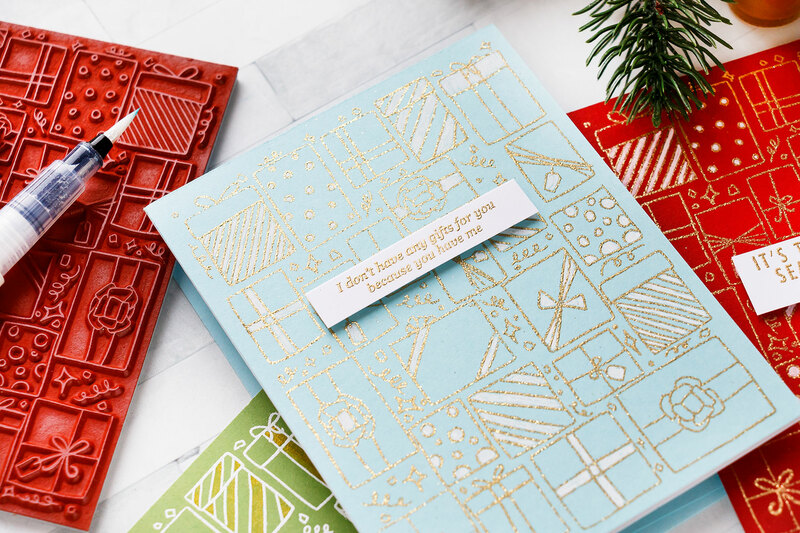 Love how easy and beautiful these cards are – those offbeat sentiments were great! Love this kit! Beautiful cards, Yana~ I love how you approach stamps and products slightly differently and come up with beautiful results! Love your teal card it is stunning. I love how you used both background stamps! I am so excited to try my hand at both types of coloring with them. Thanks for sharing. Such great cards! Enjoyed your video! wonderful, love the cards and this Nov. Kit! Thanks for sharing. Wonderful holiday cards. Awesome colors. Love each one of your cards Yana! You never disappoint. Thanks for the video & the link which I’m going to watch after I finish this blog hop. This is a wonderful Kit from Hero Arts! 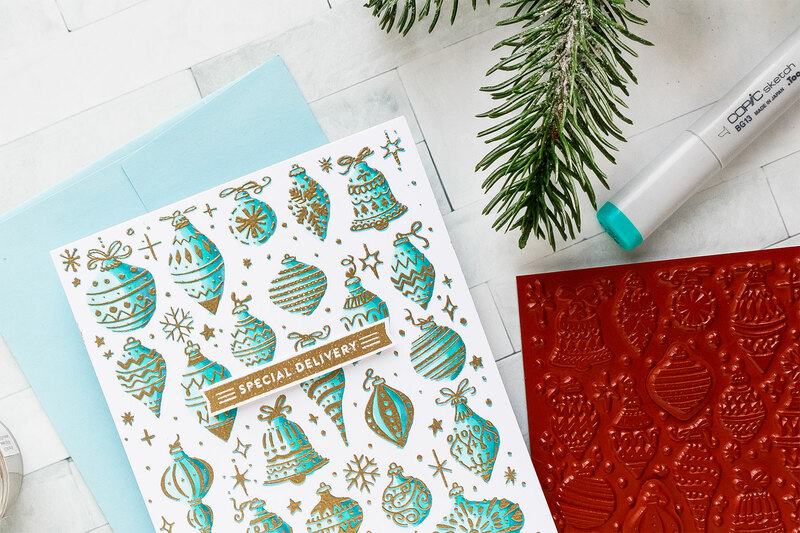 Love your card designs and colors. The gold embossing and turquoise is beautiful. 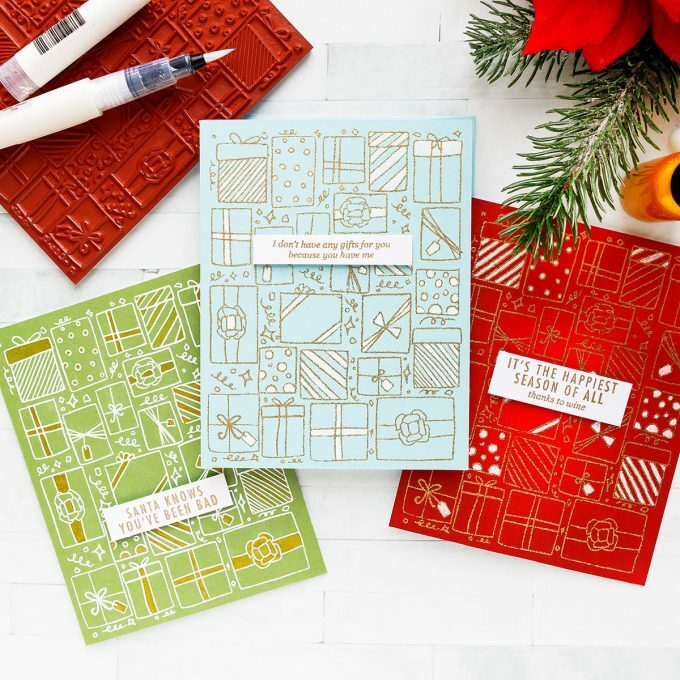 The minimal coloring on the presents background cards is really striking. Thanks for sharing. Your turquoise and gold card is so beautiful. I love how you shaded the color like the light is coming from the left. TFS! Absolutely stunning! Your cards and videos are always a great inspiration! Thanks for sharing your talent with us! Love your cards. What a unique kit to win. Beautiful cards – I love all of them. Love the teal ornaments. Love this kit! The advent idea is so unique. Thanks for showing your ideas. Your cards are the most beautiful! I love your work! Awesome Kit, Awesome projects! I especially love copic colored ornaments on white background, thanks for the video! Such beautiful cards! 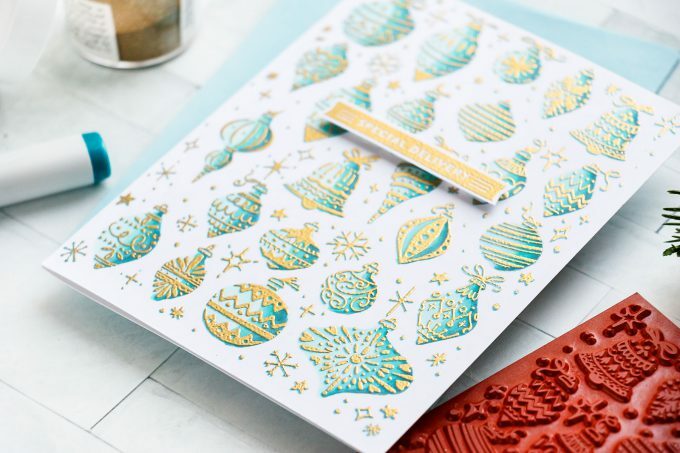 I love how the ornaments looked after your coloured them and added the gold embossing! What a great card! I LOVE it! Your cards are all stunning! I love the colors you have chosen and the skilled coloring. Thanks for sharing your creativity! spectaculr cards. Love the color for the ornaments. All these cards are beautiful, but that first one is my favorite! I love the gold and teal together . Such talent through all the blogs. Love the colors on the first card so very much!!!! OMG I love the colour combination you used on the advent calendar card! So creative! Thanks for the inspiration! Love love love the ornaments card!!! Simply gorgeous! The colors are just perfect. Loved the simplicity of the presents card, I can definitely do that in multiples! Thanks so much for your inspiration! OH MY GOSH these cards are absolutely gorgeous! I always love to see your latest creations! You never ever disappoint! I am unable to watch your video right now! But tomorrow I am definitely going to! I want to see how you created these amazing cards! Great cards. Such lovely colors. I love the coloring in the ornaments! That ornament has such great colors and I really like the way you colored them! And then.. those present cards all look very nice! I like that tip about putting the ink in a water pen with a bit of water.